For decades, Boston’s brutalist City Hall has been a heated point of debate among locals. Is it beautiful or is it ugly? Does it spark city pride or is it a dark spot among Boston’s vast array of historic architecture? Though widely praised when built in 1968, the now notorious, nine-story, 515,000-square-foot structure sits like an underutilized behemoth at the core of the downtown Government Center district. Many Bostonians are tired of it. Its commanding facade and dysfunctional interior layout are neither conducive to daily inspiration nor workplace productivity, some complain. 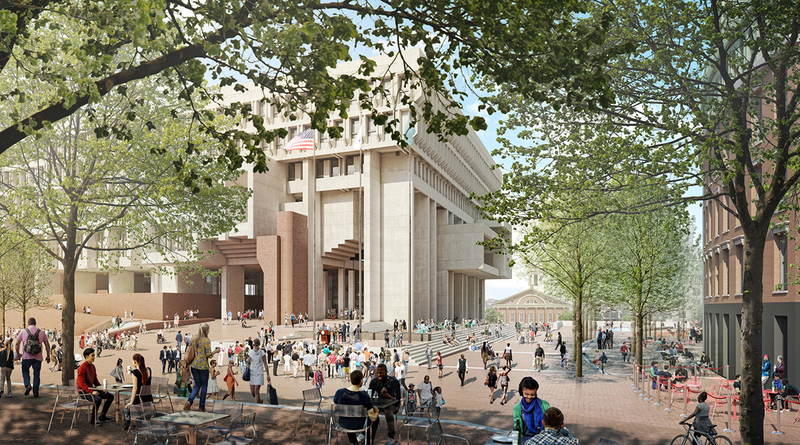 But others see it as an enduring symbol of the early brutalist movement—an icon. Regardless of its aesthetics, the building’s biggest issues can no longer be ignored. 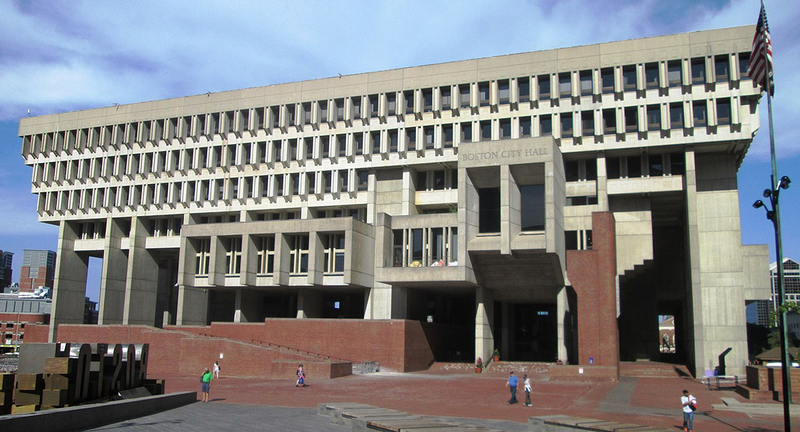 Leading up to Boston City Hall’s official 50th anniversary this year, the Mayor’s Office of Arts and Culture has instigated small changes and proposed other sweeping updates to the building, originally designed by Kallmann, McKinnell, and Knowles, that could potentially bring it into the 21st-century era of civic and office architecture. In a comprehensive report conducted through the city’s Public Facilities Department, a multi-pronged planning process to introduce both design and operational improvements to the structure has already begun. The big ideas are outlined in the Boston City Hall and Plaza Study, completed in 2017 in collaboration with Boston-based Utile Architecture + Planning and Reed Hilderbrand Landscape Architects. It makes the case for a top-to-bottom reorganization of the administrative and public service needs of City Hall and its 7-acre plaza through improved design. In order to engage both employees and civilians, the dark, precast concrete building needs to both open up to the community and provide more space for work. Circulation patterns need to be updated, wayfinding needs to be implemented, building systems and infrastructure should be upgraded, and accessibility should be top of mind, according to the report. In recent years, various government departments have moved out of City Hall due to spatial constraints. Utile aims to restructure the upper floors of the building and introduce shared spaces that can be used by different teams. Large-scale meeting rooms and public spaces will remain on the lower floors while the lobby will serve as a welcoming, secure, and light-filled entry for visitors and employees. Along with interior improvements, the project scope includes repairing the sprawling, brick plaza that surrounds City Hall and introducing a stormwater management system to the landscape. It will also feature new seating and infrastructure, as well as larger programming areas for sports celebrations and concerts, to make the plaza the next great civic hub for the city. 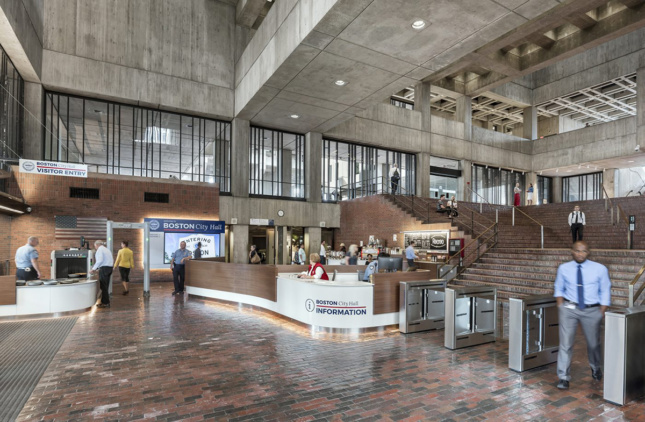 Minor changes to the facilities, including a handful of pilot projects like the new exterior lighting system as well as the Boston Winter Market, started in 2016. Urgent repairs will continue over the next four years and major renovation work on the interior is expected to begin in 2020.